This Ceramic Travel Coffee Mug is a great travel coffee mug for heading to work armed with a cup of your favorite coffee or cafe beverage. 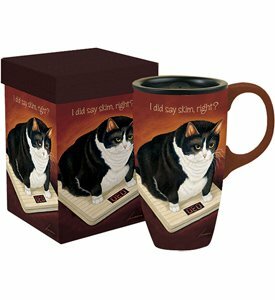 These ceramic coffee mugs are constructed from microwave and dishwasher safe ceramic and feature a full-color art wrap exterior of Lowell Herrero's painting "Stretch Kelley." Ceramic Travel Coffee Mug Features Durable ceramic construction. Recessed rubber travel lid prevents spills and leakage. Keeps coffee and other hot beverage warm over time. Large comfortable carrying handle. Lowell Herrero's "Stretch Kelly" graphic on exterior. Packaged in full-color gift box. Holds 19 oz. Dishwasher and microwave safe.